This powerful new addition to the nonprofit and public governance literature provides readers with detailed, practical guidance in building the kind of close, positive, and productive board-CEO partnership that is essential for organizational stability and growth. 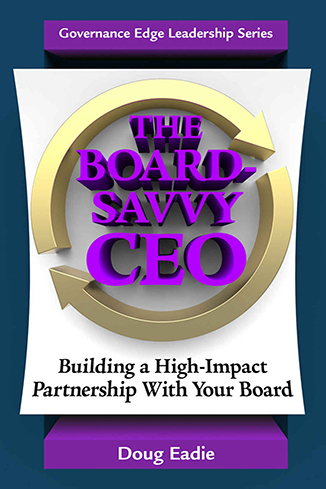 The Board-Savvy CEO tells you how to strengthen your board’s governing capacity, transform board members into satisfied owners of their governing work, and maintain a healthy board-CEO working relationship. Taking the lead in developing the board’s capacity to do the kind of high-impact governing work that makes a real difference in an organization’s affairs. Helping the board to map out processes for actively engaging board members and transforming them into strong owners of their governing decisions and judgements. And working closely with the board to ensure that the board-CEO working realationship is healthy enough to withstand the inevitable pressures that every organization experiences in this rapidly changing world.